Elections are on the cards. 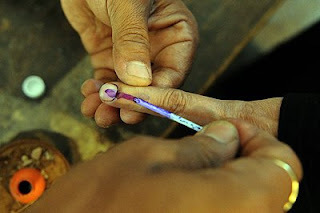 The voting procedures are not complete until you get a mark on your finger with a permanent ink. Looking at your ink-stained finger have you ever wondered from where this ink comes from and its significance? 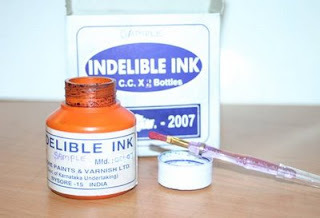 The ink called as the Indelible ink is used as a security feature to prevent double voting.It is manufactured at Mysore Paints & Varnish Limited (MVPL), situated at Mysore, Karnataka. Each polling booth is given two bottles of 10ml each for making the line on about 700 voters. Thanks to the huge election ink order, the profitable Karnataka-owned public sector undertaking, will post a sales turnover of Rs.160 million(Rs.16 crore) for this fiscal(2008-09) as against 90million(Rs.9 crore) last fiscal (2007-08). The MVPL also supplies voter ink to countries like Canada, Cambodia, the Maldives, Nepal, Nigeria, South Africa and Turkey. Nice info article,Nive..I am Proud of Institue and Karnataka. oh..thanks for the info.I find your blog really informative and spreading awareness.Good going. The story of the indelible ink is incredible.Even more incredible is the the process to register and verify the 670 million voters.Our elections require 1 million voting machines and more than 4 million officials. The cost of doing this is over Rs.1500 crores.